The graphic energy of David Tomb’s best portrait drawings at Hackett-Freedman blows away our expectation of psychological depth. Tomb uses his subjects’ appearance to get his hand going, not as inroads to their character. Visitors leave the show knowing no more than when they arrived about the people Tomb portrays, likenesses aside. Collector Robert Shimshak’s face resembles Tomb’s image of it to a striking degree, yet it reads like an excuse for the lather of charcoal and gouache marks that Tomb uncorks to convey Shimshak’s legs-crossed posture and patterned shirt. 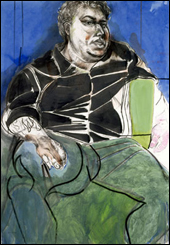 Tomb’s portraits seem up-to-the-minute not because they show a knowledge of modern portraitists such as Oskar Kokoschka and Alice Neel, though they do, but because Tomb looks harder at, and believes more in, the way fabric creases report the clothed body than at the way faces clothe identity. 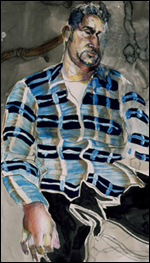 Notice how a few deft brush strokes of black over white render the folds in the black shirt of “J.J.” (2003). They report a fleshy torso to match the subject’s face, but also evoke a sort of cladding, like an armadillo shell, suggestive of some unobvious hardness. In “Feeling Groovy” (2003) — the most impressive thing here — the technique that describes the spaced-out, unnamed sitter conveys his relaxation more immediately than his slouching pose. In his treatment of the man’s plaid shirt, Tomb flutters a little manifesto celebrating the athletics of hand and eye, as against the supposed intellectual rigor for which the modernist grid stands. The exhibited portraits’ unevenness can make a viewer wonder whether Tomb yet inhabits comfortably the uncompromising artistic posture he has earned. No matter, he has let his hand go and it will take him there.